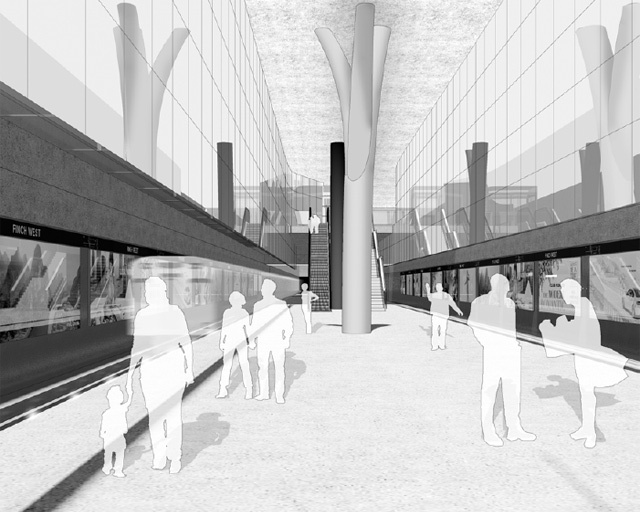 The proposed design for the platform level of Finch West station. The TTC’s plans for the stations along the Spadina subway extension are shaping up nicely—so far, we’ve seen York University and Sheppard West’s green designs, Highway 407’s boomerang shape, Steeles West’s retro blueprints, and Vaughan Corporate Centre’s mysterious dome [PDF], and now, finally, on Wednesday, the TTC will meet to discuss and approve its plans for the last station left on the list, Finch West [PDF]. If all goes according to plan, Finch West station, which is being built at Keele Street and Finch Avenue West, will feature all of the amenities that we have come to expect from a modern TTC station, including bicycle racks, a commuter parking lot, a bus terminal, a passenger pick-up and drop-off area, at least one fully accessible entrance, super-high ceilings, and natural lighting. 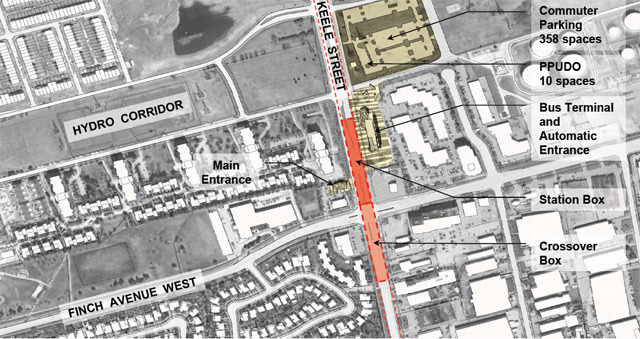 The plans also call for “provisions” for a future connection to the Etobicoke-Finch West LRT. The street-level plan for the station. An exterior view of the proposed design for the station’s secondary entrance and bus terminal. The station’s increased cost is partially due to its interior artwork, which is being designed by world-renowned Scottish painter Bruce McLean, and based on the station’s strange crystal-like exterior, we can only assume that Daniel Libeskind, the architect behind the ROM Crystal, has a secret, uncredited role as well. The TTC expects to complete the station by 2015. Until then, the next few years are likely to be loud and hectic for nearby residents, as the TTC bulldozes and builds above ground and employs boring machines underground to dig the Spadina line’s new tunnel. Thanks to Lawrence Lui for the tip. Renderings courtesy of the TTC.